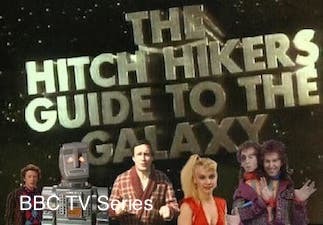 The Hitchhiker’s Guide To The Galaxy takes us to far away places following the destruction of planet Earth by the Vogons. Places that leave Arthur Dent all at sea as he adjusts to being the last remaining human in the Universe. 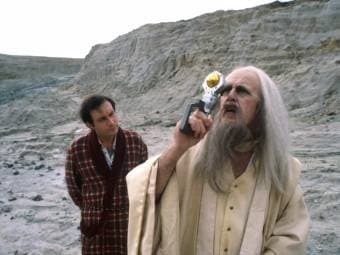 In the company of his trusted friend, an alien, Ford Prefect, he learns the golden rule of space travel. Don’t Panic. His new friends, Zaphod Beeblebrox, Marvin the paranoid android and Trillian try to make him feel at home on their ship, The heart of Gold. But it is all a struggle for poor Arthur. He misses home and a decent cup of tea. But fortunately, he has a Babel Fish in his ear, so at least he can understand everyone. Almost. 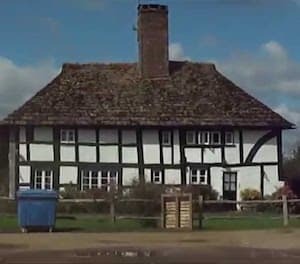 Like most sci-fi stories, far away places are the setting that Adams used in the whole series, from the original radio show through to The Restaurant at the End of the Universe, Life, the Universe and Everything, So Long, and Thanks for All the Fish and Mostly Harmless. Most famously, as I am sure everyone knows, the number 42 is key to the whole saga. Arthur and Ford travel to exotic places such as Magrathea and Milliways. But there are mentions of places closer to home that can be easily forgotten. Somewhere in the West Country of England, Arthur Dent lived in a small hamlet called Cottington. He had moved there three years before, after leaving the stressful life of London. He was believed to have frequented the Horse and Groom, a small pub with a saloon bar. 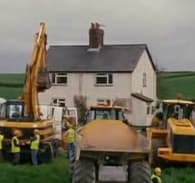 But as fate would have it, his house was was to be demolished as part of the plan to convert the entire hamlet into a service station for the new Bevingford bypass. The plan was unpopular with the locals, and in particular with Arthur. The plan would never be finished though, as just when work was about to start, the Vogons arrived and destroyed planet Earth. Luckily for Arthur, after beer and peanuts with Ford at the Horse and Groom, they managed to hitch a lift on the Vogan destructor ship, just before Earth and Cottington were erased from the Universe. In reality, though, there is no such hamlet in England. His house that appeared in the 1981 TV series was located in Balcombe, West Sussex. But in the first book, and the radio series the description is totally different. In the 2005 movie, which starred Martin Freeman, Sam Rockwell, Mos Def, Zooey Deschanel and the voices of Stephen Fry and Alan Rickman, the house fits the description in the novel. The hamlet of Cottingting is fictional. The only historical mention of Cottington refers to Francis Cottington, 1st Baron Cottington, who died in June 1652. He was the English lord treasurer and ambassador and leader of the pro-Spanish, pro-Roman Catholic faction in the court of Charles I. He was Chancellor of the Exchequer, Lord Treasurer and also Ambassador to Spain. How or if he relates to the story is unclear. The only other real place in the UK with the name is Cottington Lakes Fishery, which is located in Kent. So nowhere near the West Country. But perhaps one can imagine that so long and thanks for the fish may be connected. In the third novel, Islington is where Arthur lived in a cave during the prehistoric period of Earth. Adams refers to it again, two million years later in the fourth novel as the location of Fenchurch’s home. Douglas Adams wrote most of the first novel while he was living in Islington. He said that he was inspired by the surroundings in the area. He used the name of a local real estate agent, Hotblack Desiato, for a rock musician in the Hitchhiker’s series. In Douglas Adams’ Dirk Gently series, Dirk’s Holistic Detective Agency, Richard MacDuff’s flat, and Susan Way’s flat are all in Islington, although Dirk’s office is located on a fictional street. Where Douglas Adams lived when he wrote the book. Islington is located in Greater London, England, and is part of the London Metropolitan Borough of Islington. It is a residential district of Inner London, extending from Islington’s High Street to Highbury Fields, including the area around the busy High Street, Upper Street, Essex Road, and Southgate Road to the east. The Regent’s Canal runs through Islington. The tunnel that runs from Colebrook Row east of the Angel, to emerge at Muriel Street near Caledonian Road. Islington was named by the Saxons Giseldone in 1005, and then Gislandune in 1062. The name means Gīsla’s Hill, which derived from the Old English name Gīsla and dun, which meant, hill and down. The name later changed to Isledon, until well into the 17th century when the modern was adopted. During the 19th century, many music halls and theatres established around Islington Green. One was Collins’ Music Hall. What remains of the building is now incorporated into a bookshop. Islington is also the home of the Little Angel Theatre, which is a puppet theatre for children. Norway is mentioned in the first and third novels. The Magrathean Slartibartfast, claims to have created the Norwegian fjords and at the time when they were fashionable, he won an award for his design. He especially liked the “lovely crinkly edges”. When Ford and Arthur trek away from the site of Golgafrinchan ark crash, they see the likeness of Slartibartfast’s and his signature carved into an ice wall in one of the fjords. It makes them realise that they are on prehistoric Earth. The character of Slartibartfast was played by John Le Mesurier in the television series. Anyone who has read all the Hitchhiker’s Guide series of books can probably recall mentions of Islington and Norway. But can you recall any mention of New York? You need to delve into the fourth book, So Long and Thanks For All the Fish. Ford Prefect adds an article on Earth in the Hitchhiker’s Guide. 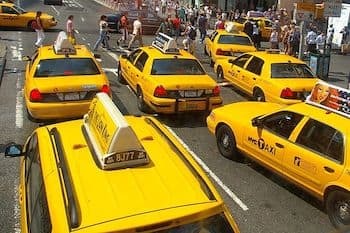 It advises an alien visitor to New York to get a job as a cab driver. The reasoning is that it is a job that does not require a human appearance, any knowledge of the English language or of the local laws of physics. In the fifth book, Mostly Harmless, Tricia McMillan, an alternative universe version of Trillian, initially resides in New York. 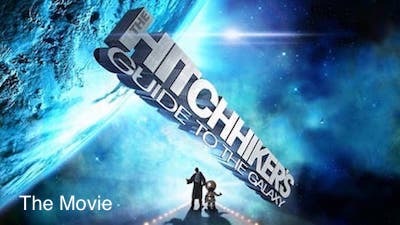 The Hitchhiker’s Guide To The Galaxy is now classic science fiction and is available in five books. The movie and original TV series are also available.